Alexis grew up racing dinghies in the waters of Brittany, France. He immigrated to the United States as a young man and developed his interest in offshore cruising and racing in New England and the Bahamas. Alexis began his professional yachting career as a charter captain sailing the storied seas of French Polynesia on a Fountaine-Pajot Marquises 56 catamaran. There he developed a talent for sharing and communicating his love for bluewater sailing to his worldly guests. More recently, Alexis spent ten years managing Nautor’s Swan Charters, a high-end charter company with over fifty Swans based in the Caribbean, New England and the Mediterranean. While at Nautor’s Swan, Alexis coordinated sales of new yachts through the French defiscalisation program. He later instituted a successful yacht sales and management program to develop the fleet in non-French territories. 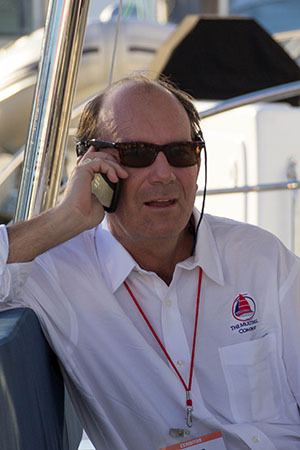 This experience gave him substantial experience in the many facets of yacht sales and brokerage in the United States, Europe and the Caribbean. Alexis is bilingual English-French. He was educated in the United States and has worked in the US, Europe and the Caribbean. He has sailed extensively on multihulls and particularly enjoys performance cats. The Multihull Company and agent Alexis de Boucaud stand head and shoulders above the competition. I think Alexis may be the most honest boat broker I’ve met and is he extremely knowable. From start to finish, Alexis controlled every aspect of the sale and everything went extremely smooth.